Army Tradition and Navy Tradition (collectively Military tradition) are long term, floating measures of the pool of experience of a nation's military forces on land and sea. They give bonuses depending on their strength, are gained through actions of the appropriate forces and decay over time if not increased. Army tradition provides higher morale and quicker manpower recovery, and naval tradition provides higher morale and better trade steering. High tradition significantly improves the skill of recruited military leaders. in the end of combat screen. Casualties inflicted on the enemy. The more kills, the more tradition. Stack wipe bonus. The complete destruction of enemy stacks grants more tradition than simply inflicting the same number of casualties. Relative strength of nations. This unknown factor determines the conversion ratio between casualties inflicted and tradition gained. It may depend on any or all of the following factors: national base tax, force limit, army size, unit types, unit quality, total manpower, current manpower, etc. If there are multiple nations on the same side of battle, their conversion factors appear to be averaged. Large nations can therefore gain considerably more army tradition from battles by fighting with smaller allies. 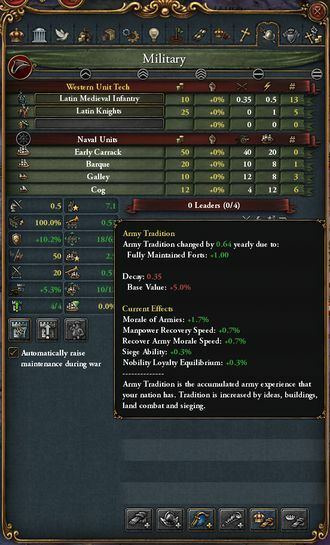 army tradition gain from battles by +50%. The number of troops that you send into battle, the losses that you suffer, and the quality of your leader have no observable effect on your army tradition gain. Note: Battles lost will not reduce tradition. It is gained regardless of victory or defeat. Each successful siege grants +1 army tradition. This is the primary source of army tradition for larger nations. Some events can affect tradition. Battles are the primary source of navy tradition. You can view how much you gained in any particular battle on the battle result screen. The amount of tradition gained in battle is directly proportional to the casualties inflicted on the enemy, as well as the relative strength of the nations involved. Small weak nations will gain considerably more tradition when fighting large strong nations. The number of ships that you send into battle, the losses that you suffer, and the quality of your leader have no observable effect on your naval tradition gain. Ships blockading ports grant naval tradition. Each terra incognita sea zone revealed through naval exploration grants +1 naval tradition. ↑ See in /Europa Universalis IV/common/static_modifiers/00_static_modifiers.txt (Static modifiers#Army tradition). ↑ See in /Europa Universalis IV/common/static_modifiers/00_static_modifiers.txt (Static modifiers#Navy tradition).